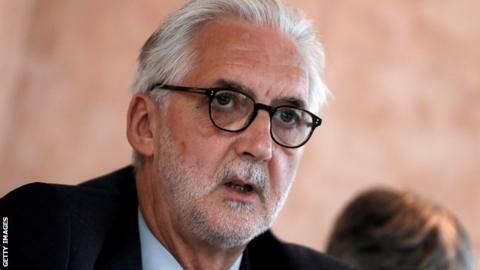 The head of cycling's world governing body Brian Cookson says he did nothing to be "ashamed of or concerned about" during his tenure at British Cycling. Cookson, who led the organisation for 17 years before becoming UCI president in 2013, belatedly contributed to a review into the culture of British Cycling's performance programme. The final report is expected in May, but a leaked draft of it was scathing. "Some of the things I've read have been unfair and unbalanced," he said. "I believe that the draft is only a partial investigation and that's reflected by the content of the draft. "I hope that what I have said, along with various others who have now commented, will result in a more balanced final report." The leaked version claimed British Cycling "sanitised" its own probe into claims former technical director Shane Sutton used sexist language towards Jess Varnish. It also spoke of a "culture of fear", with some staff "bullied". British Cycling has subsequently admitted it did not pay "sufficient care and attention" to the wellbeing of staff and athletes at the expense of winning medals. UK Anti-Doping (Ukad) is currently investigating allegations of wrongdoing against Team Sky and British Cycling, which both deny. Last October, Cookson said he would be "surprised and disappointed" if any evidence of wrongdoing was discovered. Cookson, speaking at the Track Cycling World Championships in Hong Kong, said he was reluctant to comment more fully until the final report was published. But he denied that his reticence was because he is currently campaigning to retain his presidency of the UCI. He also confirmed that he will not ask government funding body UK Sport - which contributed £77,000 to his election bid in 2013 - to finance his attempt this time. "British Cycling will be supporting me in a modest way and I think that's normal," he said.